Use your 12 volt accessories without worry of draining your battery in your Truck, Car, RV or Boat! Automatic power detection senses when levels are below safe start minimums. 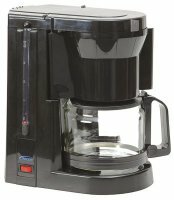 Large 10 Cup Carafe with 'Drip Stop' allowing you to pour at anytime during the brew cycle.